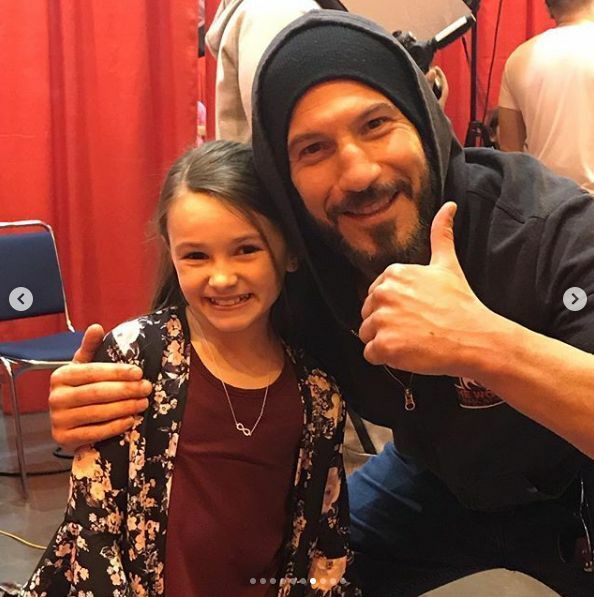 Judith Grimes actress Cailey Fleming posed for a photo with former Walking Dead star Jon Bernthal, who played Judith’s biological father Shane Walsh. Fleming now stars as Judith after a six-year time jump that followed the apparent “death” of father Rick Grimes (Andrew Lincoln), who once admitted in a Season Seven episode he knew Judith was born of the affair between Shane and Lori Grimes (Sarah Wayne Callies). “I know Judith isn’t mine. I know it. I love her. She’s my daughter. But she isn’t mine,” Rick confessed to lover Michonne (Danai Gurira), who has since fully embraced Judith as her own daughter. It was later determined by Family Diplomacy, a Tampa Bay-based Collaborative Law firm, that Rick would be considered Judith’s legal father despite her being Shane’s biological offspring as result of Judith’s being born during an intact, albeit strained, marriage between Rick and Lori. If Shane and Lori’s affair happened before apocalypse, the group noted, Rick would then be entitled to making major decisions concerning the child and would be responsible for her financial support. Michonne later gave birth to Judith’s brother, RJ (Antony Azor), or Rick Junior, Rick and Michonne’s first shared biological child. Judith has an important role to play in the future of the series and will assume some of the comic book stories that otherwise would have belonged to late half-brother Carl (Chandler Riggs), including sharing an interesting dynamic with the formerly jailed Negan (Jeffrey Dean Morgan).